This page tells you a little about the fifty-five-year ministry of Ron Graham, the author of simplybible.com —an Australian Bible study resource. It's just a humble history, nothing to boast of, and many men have done greater things by far. However, it may interest you for this very reason, that it is the ministry of an ordinary "Aussie Battler" whom God called to preach the word in many small corners. Ron Graham became a Christian as a very young man, and became a preacher before he turned 20. He was supported by 11th and Birdwell Church of Christ (Big Spring Texas) in his first seven years. For five of those years he trained under mentors —preachers from the USA associated with 11th and Birdwell. This Timothy-Paul relationship gave Ron a wonderful start. The 11th and Birdwell church would have supported Ron longer, but Ron felt it necessary to try to support himself, partly at least. So Ron took a position selling life assurance with MLC and stayed with them seven years. However he remained dedicated to the ministry and preached regularly. Ron has continued his ministry down through the years, with Australian churches of Christ supporting him at least partially most of that time. However he has worked with his own hands too, doing a variety of jobs including book selling, window cleaning, papermaking, traffic surveys, mowing grass on a tea plantation, chair making, hospital laundry, and fruit picking. Ron was privileged to be involved at the start of a new wave of the restoration of New Testament Christianity in Australia. This occurred in the nineteen fifties. Ron knew, and was greatly influenced by, great men such as Tom Tarbet and those who came after him to Australia. Weeknight training classes in Melbourne and Summer schools of preaching in Albury were run by Tom Tarbet. Ron attended these. Ron especially loved Felix W. Tarbet, with whom he travelled from church to church all over eastern Australia. American missionaries of the mid nineteen hundreds were not the only influence on Ron Graham's ministry. His family includes preachers in churches of Christ going back generations. This has had a profound effect on Ron's attitude to his own calling to the ministry, and his determination to stay on "the old paths where is the good way". Ron's father William Henry Graham was a staunch New Testament Christian. He was a scholar of the koine Greek. He worked with the Chinese Missions, and was one of the lonely voices crying in the wilderness against many “digressions from New Testament Christianity” that were being widely accepted and promoted in the early nineteen hundreds. Phoebe's father, George Exley, was well known for "his useful labours in the preaching of the gospel" according to an inscription in a Bible in Ron's possession. That Bible was presented to George by the Alphington church. George Exley was originally a lay preacher with the Wesleyans. He came to know the way of the Lord more perfectly, and was a faithful and successful preacher in the churches of Christ from the mid eighteen hundreds. George's brother, Henry Exley, was instrumental in bringing George into the Lord's church. In 1863 Henry Exley was preaching in Chelsea London together with HS Earl, an Englishman who had been resident in America and was known to Alexander Campbell. In 1864 Mr Earl travelled to Australia. Henry had Mr Earl visit his brother George, who promptly converted. In 1880, Henry himself travelled to Australia with a preacher Timothy Coop. In Melbourne the two brothers Exley, Henry and George, were reunited after 28 years of separation. Henry Exley was originally a Methodist. From the age of fifteen he was “speaking and teaching in religious meetings.” When Alexander Campbell came to Wakefield England, Henry went to speak to him about the false doctrine he was preaching, only to be convinced that Campbell was right. Henry was baptized and at the age of 30 he became a full time preacher. Not only did he work in England and America, but also in Australia and New Zealand. Ron is indebted to his sister Stephanie, researcher of our family history, for giving back to our generation a much more accurate and detailed understanding of these connections to the past. Missions. Although Ron Graham has worked with a number of local churches of Christ in Australia, a significant part of his ministry has been distributed. As mentioned above, Ron made several journeys visiting from church to church in "missions". Publications. Ron Graham has worked on a number of publications through the years. He worked editorially and as a staff writer on an Australia wide publication Truth in Love. He also wrote for other publications and even produced some small-scale periodicals himself. Videos. More recently, in the nineteen nineties, Ron produced over one hundred half-hour video Bible study programs. He wrote the script, did the camera work, computer art, video editing, presentation, promoting, purchasing, packaging, and posting. Well over 1000 cassettes were distributed around Australia at cost. The church in Frankston then known as "Bay City Church of Christ" assisted and encouraged Ron in this work. The videos are still in use in many places including overseas. Distribution continued until December 2002. The videos have been archived on video disc (DVD) with the help of the Bairnsdale church of Christ but are not currently being distributed. Vanuatu. Near the end of the 20th century, Ron spent the best part of a year as a missionary in Vanuatu, preaching and holding classes in various places on Efate, Ambrym, and Tanna islands. Ron learned Bislama Vanuatu’s national language, so that his teaching could be understood by folk who did not know much English. Bundaberg. The last church that Ron worked with was at Targo Street Bundaberg. Ron was the pulpit minister there, presenting over 1000 sermons and Bible classes there in a decade of service. Ron has now retired from that work, to concentrate on his growing internet work. Internet. 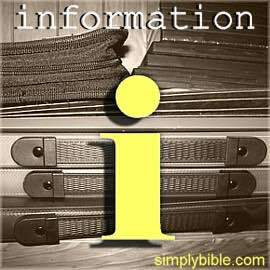 Ron’s ongoing labour is this website simplybible.com with more than 1400 Bible study pages. The site reaches people all around the world, with more than two million page views per year. Since 2001, Ron has continued to spend many hundreds of hours putting the unique website together, and it serves, among other things, as an archive for Ron’s work over sixty years. Writing the content for new pages, or additions to existing pages. Marking up the web pages in html to the latest standard. This defines all the content and literary structure of each page. The style sheets coded in css. These define the design and appearance: the colours, fonts, positioning of elements, and controls them to fit nicely on various screen widths from large down to mobile phones. Images including sprites, mainly icons and theme pics. Ron keeps images to a minimum for the sake of page loading speed and the many users on slow internet.